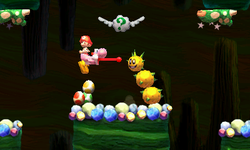 Underground Pokey Patrol is the second level of World 4 found in Yoshi's New Island. Yoshi starts the level in a cave and has to go past some enemies and enter a nearby pipe leading to the Checkpoint Ring. After passing some more enemies, Yoshi enters another pipe which leads to an area with three green Pokeys and another pipe. This pipe takes Yoshi to the Goal Ring.